« Banana Breakfast Cake becomes a Dessert! I have several old, really old, Austrian and German Cookbooks that I truly treasure. These books came to me as gifts from relatives in Austria and friends who know my passion for Austrian Cooking. My oldest book is – “Davidis Kochbuch” author: Marie Walter, Globus Verlag Gm.b.h. Berlin , there is no date when it was printed or published. Another is: ” So Kocht man in Wien” Author: Rudolf Roesch, Verlag – Ernst Reinhardt in Muenchen. Herbst 1938. This was an example for all the recipes in the book, even though there are grams, Miligrams. Mililiter, etc. of the different ingredients listed. However, these are in essence only guidelines to your own creativity…. And this is totally my philosophy of cooking. No matter how exact I write my recipe that I publish, and no matter how many “interns” I have to reproduce my recipes before I publish it, it will never be 100% reproducible in someone else’s hands and kitchen. I have many, many cookbooks and have cooked out of most of them, and more often than not, the recipes do not come out as they are described. The only way one can be successful in following recipes in cookbooks is to add a little of one’s own creativity to the final successful outcome of the dish. Therefore, keep on cooking, the more you cook the better you will become. Use an 11 inch round spring form pan, or a medium size rectangular baking pan. Use a food processor: add the flour and the cool butter – pulse a few times to create pea-size little balls, lastly add the sugar and pulse only a couple of times to mix the sugar into the mixture…. 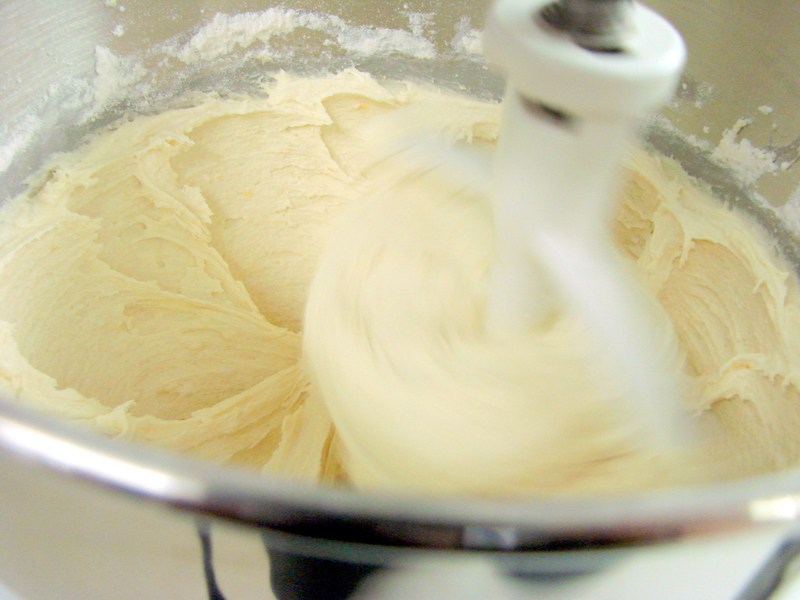 In an electric mixer beat butter and sugar until light and fluffy. Add eggs – one at a time. 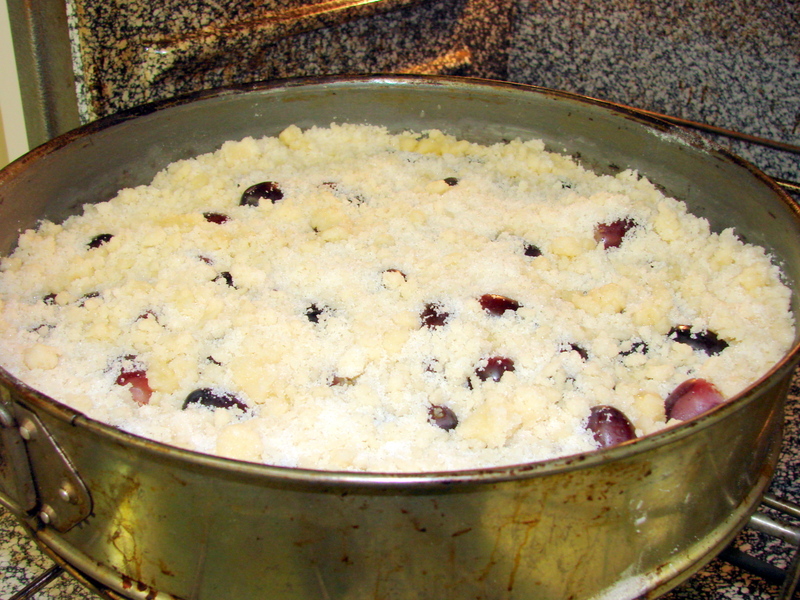 Grease and dust with flour – a medium size glass baking pan or an 11 inch spring form. 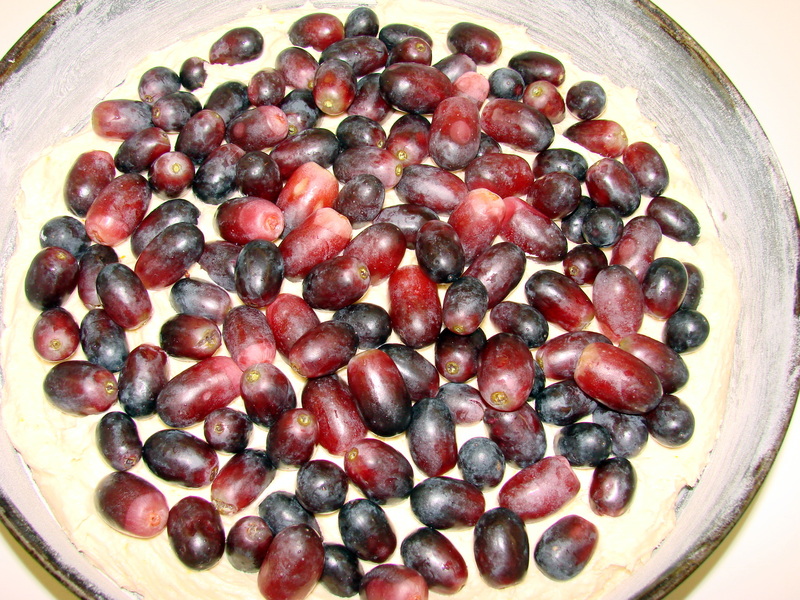 Pour the dough into the pan – then place the dried, dusted with flour -grapes on top. Bake cake at 350 F for about 1 hour – or until cake thermometer registers 180 F in the center of the cake. You need to see cooking bubbles in the center of the cake…. Cool to room temp – before serving. I invite you to an Afternoon Coffee! Exactly the sort of sweet that I remember being served when invited to afternoon coffee. Really nice story and pics, Maria. This is amazing, Maria. I am so thankful that you share your recipe. I love all the simplicity of the recipe and definitely will try to cook for my family and friends. Pranee…so nice of you to stop by and leave such a nice comment….and I am happy that you will make this cake for your family….it is really simple to make…my best to you….with a hug! Thank you for sharing your wonderful recipes. Looking forward to make this cake. Could you replace the grapes with another fruit? 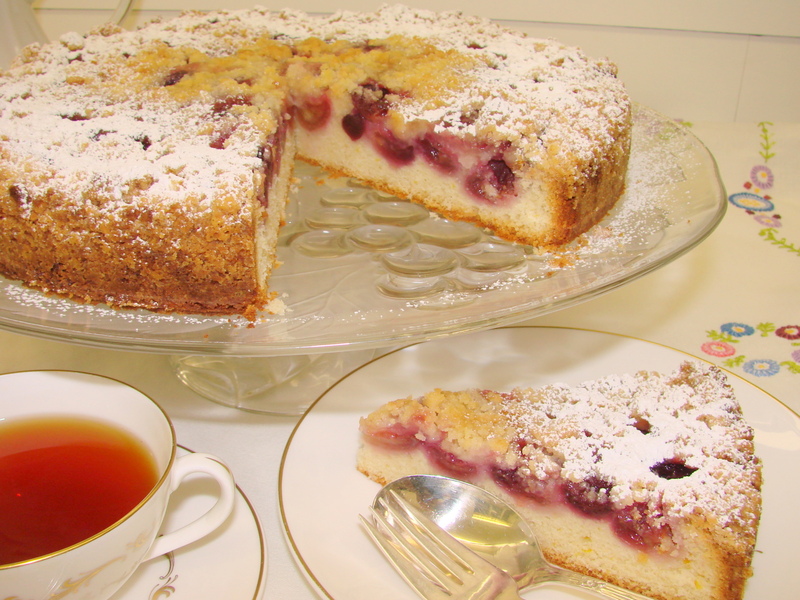 Hi Carolyn….so nice of you to leave a comment….and – yes, you can replace the fruit in this recipe…..try cherries, apricots, and any kind or berries….plums are very nice as well…………have fun trying different fruit and let me know how your cakes come out…. Totally agree with you Maria, the only way one can be successful in following recipes in cookbooks is to add a little of one’s own creativity to the final successful outcome of the dish! LOVE Streuselkuchen, and I love old cookbooks, thank you so much for introducing us some of them! 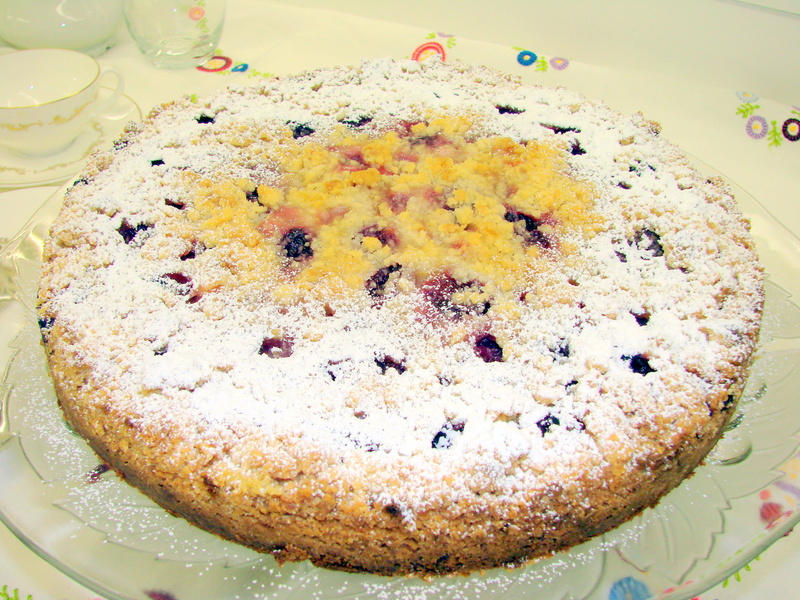 This Grape Streusel cake looks and sounds like the perfect afternoon coffee cake! Fantastic! Dear, dear Tanja…so good of you to stop by…and commenting in such a lovely way about my story…. I love your blog as well and all your beautiful photographs…you are a true artist…in baking, cooking and photography…a big hug to you………. I absolutely ADORE this cake Maria 🙂 And I love that wonderful qoute in the beginning – I too am a big believer in ‘a dash of this & a splash of that’. This one I am going to make soon for sure..such a kitchen staple! 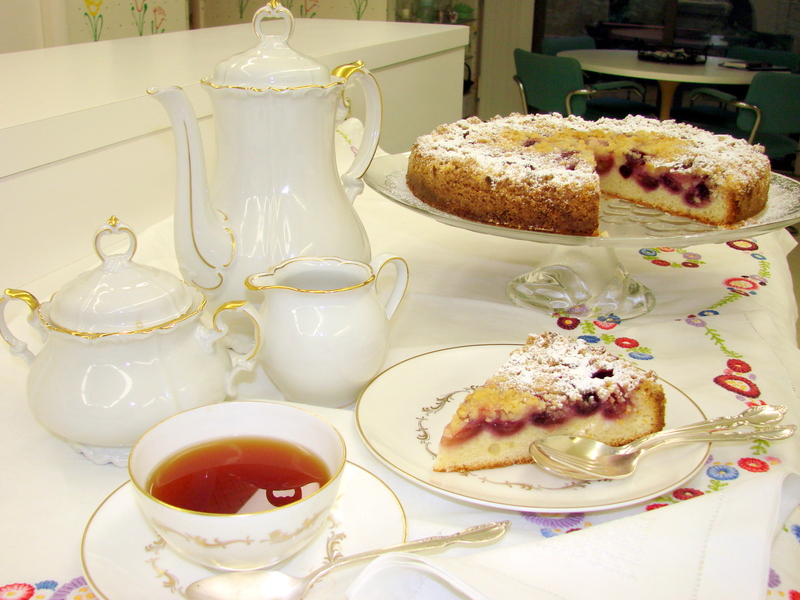 Hi Devaki….so nice to hear from you so quickly….I too love that Viennese Grape Streussel Cake….it is so versatile….it is very delicious with coffee, tea or ice cream….or simply on it’s own…. Where do you teach cooking classes? This cake i can eat with my eyes, because it’s so lovely! I’m so happy to have found you blogue maja. I am so happy you are here…and I hope we can stay in touch often…. A big hug back to you….